Can't find your make or model listed above? Rocky Road Outfitters manufactures and offers equipment for many different 4WD's. Click on your vehicle make below to find more information on great Rocky Road equipment for your vehicle. 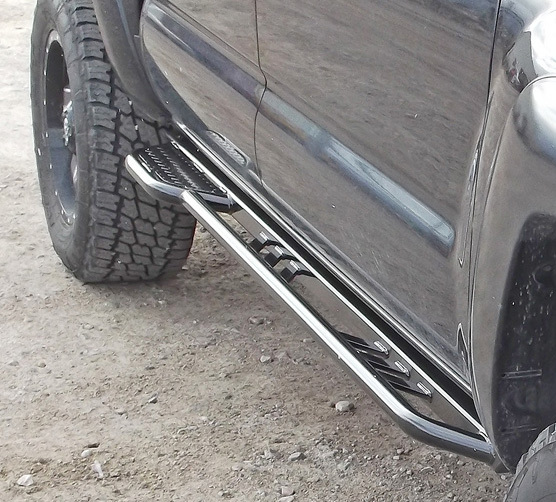 We're very proud to be recognized as THE leader in rock slider protection for offroad vehicles. Our Rockrails are literally world-famous for being indestructible and offering maximum protection for your vehicle with our lifetie guarantee. Our Rockrail lineup includes dozens of vehicles and various models for each vehicle. Pictured at left is our Kicker Rock Slider model, we also have a standard Rockrails, and our Uber popular Superslider kits. Click on the photo for a full listing of our entire Rockrail lineup. "If only the Titanic had these on...."
Tepui tents, widely regarded as the top in the industry for quality and features. 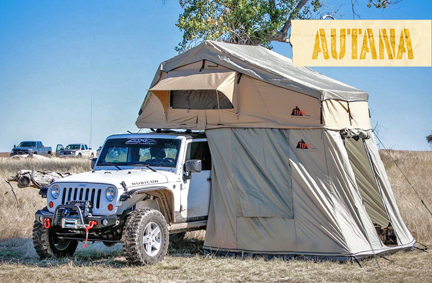 Now you can enjoy purchasing Tepui Roof Top tents with Rocky Road for any vehicles, and particularly those vehicles for which we manufacture rack systems. Any search, on any chat board, mail group, internet offroad group, or trail ride for that matter, will always net the exact same result.... that Old Man Emu suspensions are second to none in this world for quality, durability, and ride comfort. At Rocky Road, we are proud to be one of the world's top suppliers of OME suspension components. Rocky Road carries OME suspension systems and components for all Toyotas, Jeep, Land Rover, Nissan, Isuzu, Mitsubishi, Suzuki/Geo, Mazda/Ford. If OME makes it, we carry it; so email us if you don't see your part in our listings. Click on the OME logo above for more information on our unbeatable selection, experience, pricing, and links to your vehicle's suspension. Rocky Road is not only a stocking wholesale distributor for ARB, we sell direct to the public and our customers. We carry high quality ARB / Australian safari products for nearly every 4WD vehicle. Rocky Road will always be commited to bringing you the best products, service, and pricing. Find out why Rocky Road Outfitters is a leader in ARB sales throughout the world. Click on the ARB logo for more info. Smittybilt winches have most of the features as more expensive winches, but are designed to fit any budget. When you simply want the best, look no further than Warn. Since 1959 Warn has been providing world-class winches and recovery gear. For most 4WD vehicles. The best quality safari racks with great accessories. The beefiest racks on the market, made with the true offroading outdoorsman in mind. Click on the picture for more info. Think of these as a protective "cup" for your axles. Don't run around naked on the trail. PROTECT yourself!!! 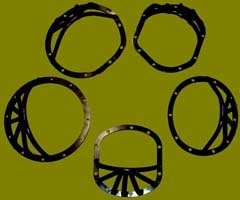 Click on the pic for info on our great and growing selection of rock guards. Available for many vehicles and a favorite of Jeep owners. Check out our Warrior line-up of products clicking on the logo above! Rocky Road has THE lowest prices on the planet for Lockright and NoSlip locking differentials, guaranteed! Cash Rebate from Feb 1 to April 30! Great deals on overstock, returns, or scratched and dent merchandise. Act fast - products are available on a first come, first served basis! Our headers are world reknowned as the best available for any vehicle, see detailed information by clicking the logo. All Thorley headers are 50-state SMOG legal and come with paperwork and sticker for those in picky states. Snowplows designed not only for trucks, but also most every SUV and 4WD on the planet. Click on the link above to view information on our great Snowplow lineup and unbeatable pricing. Stumped looking for a gift to buy your favorite wheeler? Why not let them choose! Good for any product we offer and they never expire. Why shop Rocky Road Outfitters??? Who runs the show around here? Click the pic to find out!